We were delighted to work with St Helen’s Church of England Primary School in Bristol as they celebrated their 50 year anniversary on their current site in Alveston. Our Managing Director, James Collis-Pritchard, worked directly with the school to mark this very special event. The MUGA was built on a site that formerly housed the school’s old swimming pool and changing room. It had been derelict for 15 years before Pentagon transformed it into a fabulous new sporting area, forming part of a significant project to develop the outdoor environment at St Helen’s. First, we removed all the old foundations and remains of the swimming pool and changing room building, before infilling the site with a high grade compacted stone to bring up the levels. 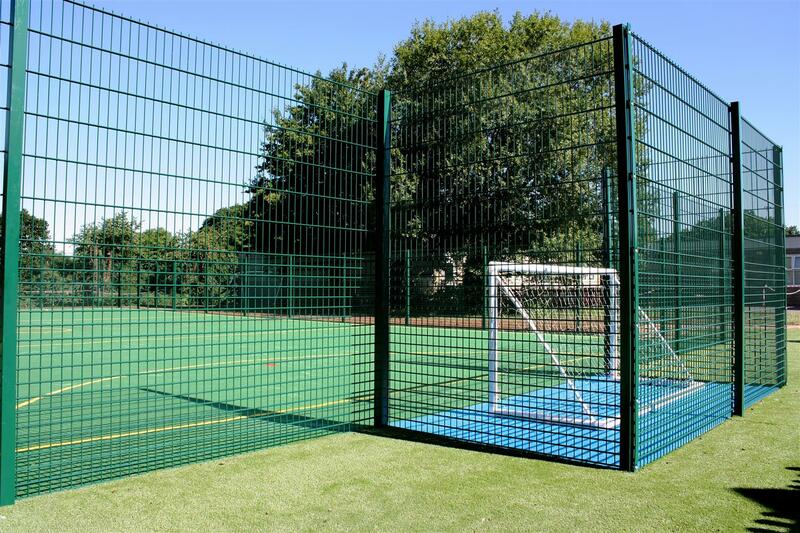 Then we built up and installed the 26m x 16m MUGA surrounded by 2m high secure green rebound fencing and gates. 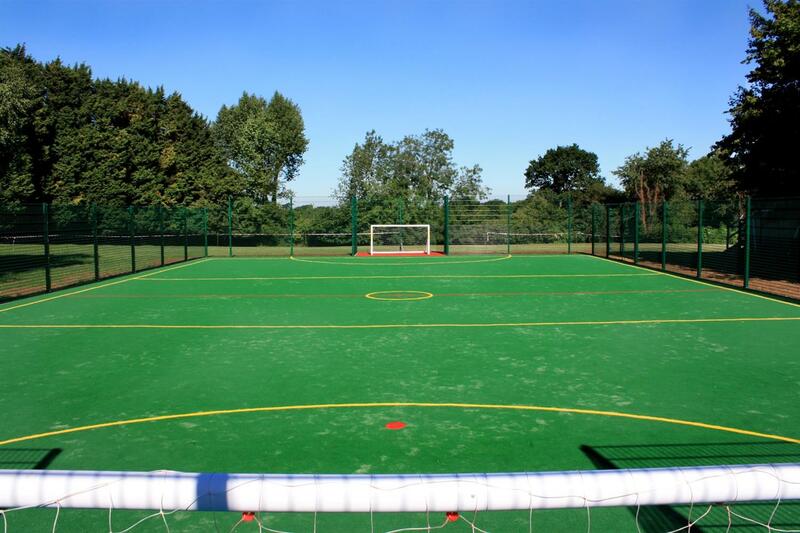 For the court itself we used an All Weather sports court, with a striking green multisport flooring and shockpad underlayer. The addition of 2.5m staggered recessed end goals (one end with red surfacing and the other end with blue, so players can pick their teams! ), a halfway line, markings for netball and even cricket stumps, make this a truly magnificent multi-sports area. The MUGA is adjacent to the school playground so children can easily access it on a daily basis. 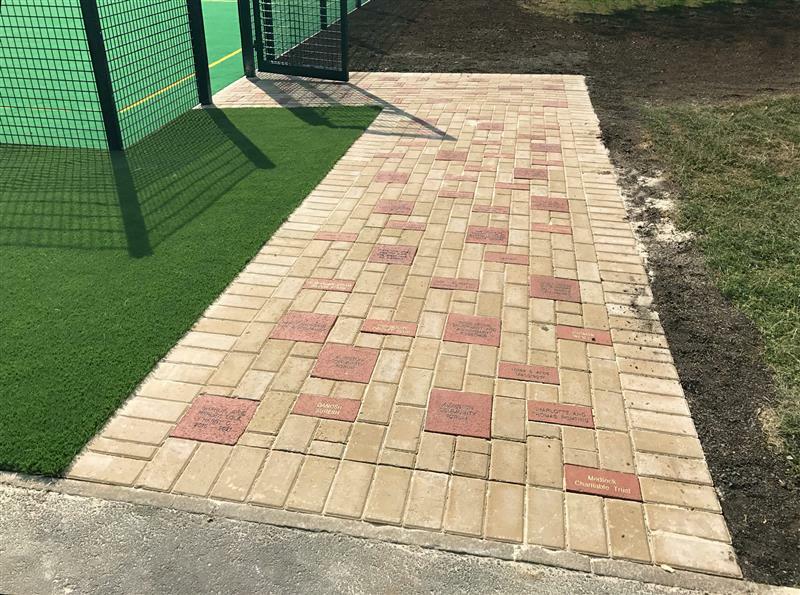 To create a clear pathway leading from the playground to the MUGA, we installed some beautiful brick block paving, interjected with inscripted blocks sponsored by the PTA and friends of the school, who made this new development possible. This is a very special feature that will be there for years to come. Finally, to ensure that no muddy areas develop around the MUGA and pathway, we installed playturf grass around the edges. It’s a fabulous facility which the pupils at St Helen’s will be able to enjoy using all through the year. 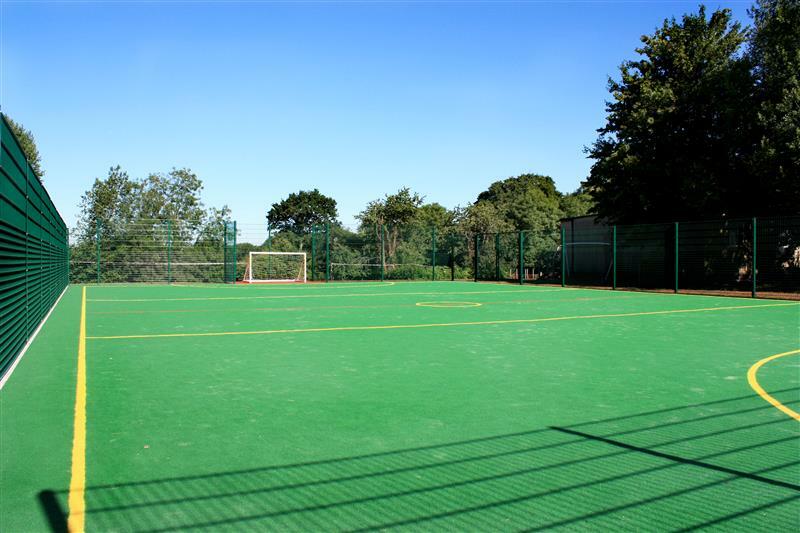 The school are delighted that they have been able to deliver a really significant project for their children, and create a lasting sporting legacy for the school and future children. All the current pupils have already been making great use of the space! Football, tennis, cricket, netball, whatever the sporting curriculum there is now no stopping them. Children are improving their team skills, fitness and key physical skills, and of course their sporting technique. The school held a very exciting grand opening of the MUGA, attended not only by children and parents, staff and friends, but also by players from Bristol Rugby team and their popular and long serving “Brizzley Bear” himself! To top off the event, St Helen's Primary School hosted and won a 5-a-side tournament on the new facility, winning the “Arthur Gardiner” Cup! Sally Conway, Olympic medalist and former pupil at St Helen’s, visited the school in advance of the installation of the Multi Use Games Area to talk with the children about her experiences and answer their questions. We wonder how many more pupils will follow in Sally’s medal-winning footsteps now that they have this fabulous new sporting facility to enjoy! If you are interested in our range of Multi Use Games Areas, or would like some new ideas for your school playground and outdoor sports environment, please do not hesitate to Contact Us to arrange a free consultation and site visit.